Clinical trial sponsors are clearly accountable for ensuring clinical site personnel are properly trained. For multi-site trials, the sponsor must ensure that all investigators receive the same instructions on how to follow the protocol and other trial-related documents, how to meet the same standards for evaluating clinical observations and laboratory tests, and how to complete the observation workbooks. With the advent of large, complex, global clinical trials this obligation can be overwhelming, time consuming and expensive to fulfill. 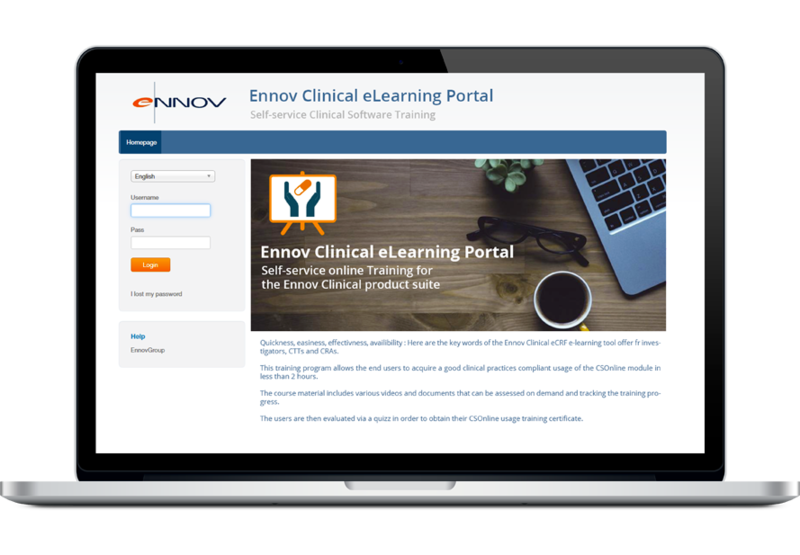 Ennov Clinical eLearning is a purpose built solution to address the problem of training large and geographically dispersed clinical teams on the use of Ennov EDC software. Ennov Clinical eLearning provides clinical team members with a contemporary and interactive learning experience that keeps them engaged and ensures consistent and uniform training for all clinical staff. The eLearning module is a distance learning program that allows trainees to complete their assigned courses from their office or their home. The program leverages web and multimedia technologies aimed at varying the modes of learning and keeping the trainee interested in the content. This new way of interactive learning combined with the freedom to complete their assigned training when it is most convenient for them increases compliance and accelerates site startup. To best meet your needs, Ennov Clinical eLearning solution is fully configurable and customizable to be specific to your protocol. Whether you are a trainer or a student, the interface has been designed with the user in mind so it is very easy to integrate your supporting tools. Ennov Clinical eLearning manages all the logistics of online training, from the design of the documents to the scheduling of the participants. The eLearning module includes a course for Investigators and Clinical Practice Technicians featuring the business scenarios and questions most frequently asked by people in these roles. A second course is specific to the Clinical Research Associates and highlighting the methods of using EDC when monitoring patients.